Our knowledge of cancer progression has grown exponentially since the discovery of oncogenes and our ability to model carcinogenesis and cancer initiation. Still the major challenge faced by physicians is the prevention and treatment of metastasis, the main reason for cancer related deaths. Our understanding of metastasis has lagged behind that of primary tumor biology and even with a surge in metastasis research we are far behind grasping its complexities. Progress has been hampered by the research paradigm itself, which states that metastasis is an extremely late event in micro-evolutionary and temporal scales and driven by a tumor centric view. This information was mostly derived from models that use highly genetically aberrant and aggressive cancer cell line models and ignored the tumor microenvironment in the target organs. Thus, the field has accepted that metastases are an aggressive variant of the primary tumor and that these lesions share most characteristics that are mostly autonomous. This conclusion supported that primary tumor information should be sufficient to target the metastasis. So far this paradigm has shown moderate success at best in revealing the intricacies of metastasis and very little in yielding successful therapies to stop metastasis. This book on metastasis is timely as we are at a turning point in metastasis research, which will impact the future of patient’s treatment. The focus of this book is key to highlight how little we understand about cancer metastasis but also shows how great progress has been made in understanding the complexities of metastasis. This includes accepting that the complexities of metastasis biology are different from the primary tumor and that the target organ microenvironments play key roles in defining the biology of the metastatic cancer cells. The chapters in this book are centered around the idea that there are minor populations in primary tumors termed cancer stem cells or cancer initiating cells that appear to also have the power to fuel metastasis. 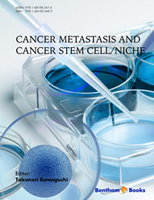 The chapters cover the role of the microenvironment composed by stromal cells and immune cells in determining the fate of the primary tumor and metastasis progression. The role of pre-metastatic microenvironments is also highlighted and the cancer stem cell concept is integrated with how niche signals impact epigenetic mechanisms that affect the expression of surface markers such as glycans to regulate the CSC behavior. The authors also cover the areas of secreted vesicles as important signaling mediators between the tumor and the stroma and the role of angiogenesis, which is a clear factor for metastatic maintenances. One chapter is focused on the development of imaging modalities to improve the detection of rare cell subpopulations in tumor lesions, and such advancements are critically needed. This becomes critical when thinking that after surgery and treatment and before metastatic outgrowth there is a period of minimal residual disease (MRD). This periods can last for decades when the seeds of metastasis are dormant and for which we have no evidence-based treatment and imaging modalities. Unfortunately this stems primarily from the lack of our understanding of the biology that defines MRD, dormancy and reactivation. However, the chapters will illustrate that the field has moved forward significantly and new findings are routinely published that are expanding our understanding of metastasis and how to target it. As mentioned before this book comes at a time when a change is needed if we are going to be successful in targeting metastasis and that requires deepening our understanding of the biology of disseminated disease, developing markers to detect it, image it and come up with new therapeutic strategies that are based on the direct knowledge of MRD biology and metastasis and not inferred from extrapolations based on primary tumor information, that is sometimes gathered a decade or more before manifestation of the metastasis and thus may be a very different disease. The work highlighted in this book is a testament of the excellent work being developed worldwide to target this deadly step of the disease and possibly our best short-term chance to change the course of cancer treatment and improve patient’s life. A malignant tumor is an actively growing tissue, composed of cells derived from a single cell that has undergone abnormal irreversible differentiation. These cells have two fundamental qualities: invasion and metastasis that induce the risk of cancer. Interestingly, recent researchers suggest that a malignant tumor is originated from cancer stem cells (CSC) accompanied with the niches. In this eBook, I would like to ask how the invasion and metastasis of cancer cells are explained by CSC theory and/or niche theory. The major points are as follows. The first point of discussion is about the CSC/ niche in carcinoma in situ lesion which appears in various types of cancer including breast and bladder cancers. Where is the niche corresponding to CSC in the above situation and what is the role of the niche in cancer progression? Cancer metastasis involves two characteristic occurrences: “organ preference metastasis” and “metastatic potential”. Can these metastatic characteristics be explained by CSC /niche theory well? The mechanisms of cancer metastasis include non-invasiveness (carcinoma in situ), lateral/side invasion, stromal invasion, intravasation, circulation, arrest, attachment, extravasation, early growth, growth, and sometimes secondary/tertiary metastasis. This is followed by cellular/molecular mechanisms including cellular adhesion molecules such as carbohydrates, chemotactic activity by producing pseudopodia and invadopodia, deformability/plasticity and cytostreaming of metastatic cancer cells, and survival of metastatic cancer cells in floating (substrate-independent condition). Can these phenotypes of metastatic cancer cells be explained by cancer stem cell theory? The goal of this study is clinical application of the knowledge obtained by CSC/niche theory. CSC/niche targets have important therapeutic implications. The role of CSC/ niche on therapies for the prevention, maintenance therapy, personalized care, and perhaps even integrative care of cancer will be discussed. I make a grateful acknowledgement for Mrs. Michiko Hoshi, who works in preparation of this book.